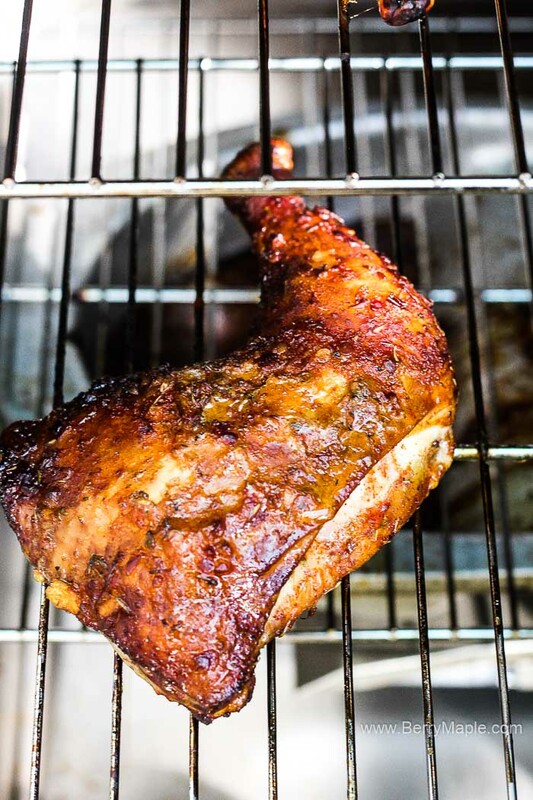 Delicious easy recipe for smoked chicken quarters in your electric smoker. I use Masterbuilt smoker but any charcoal smoker will work too. 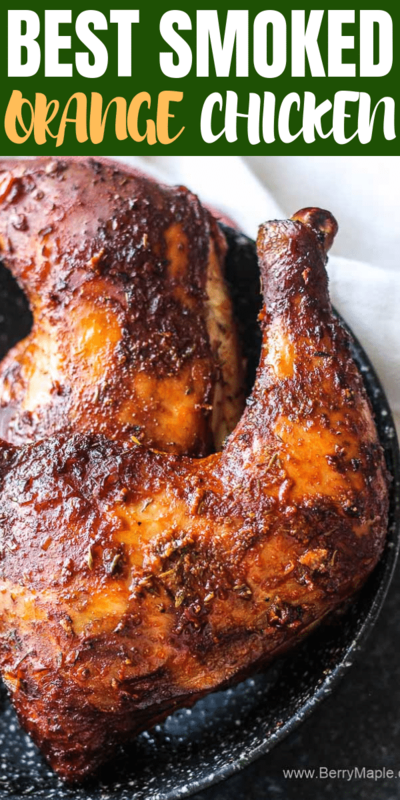 Flavorful rub and orange glaze make this dinner meal absolutely fantastic. Chicken is very easy to smoke, much easier then smoked ribs or brisket. Its comes very handy when lets say you have gy=uests coming in couple hours and you want to impress them with some flavorful smoked food. 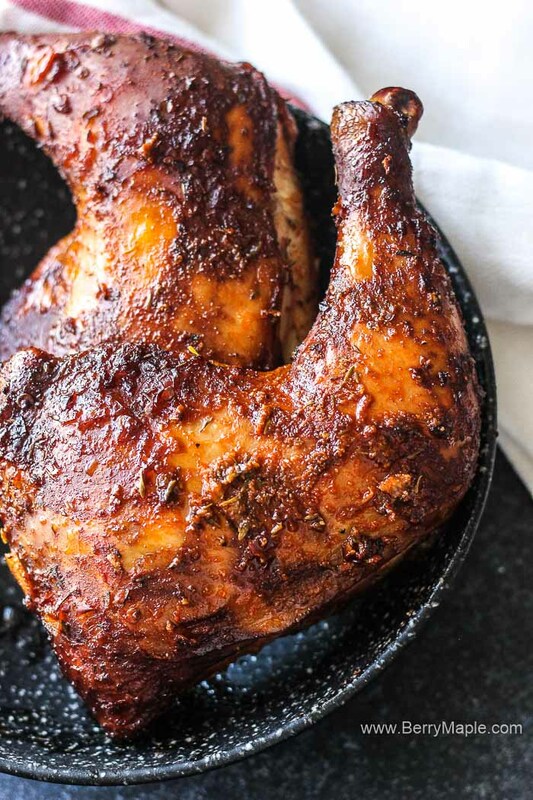 This chicken quarters are done in about 1 hour to an hour and a half. I use a thermometer to make sure my chicken is cooked through. All you will need is to insert the thermometer into the thickest part of the chicken (don’t touch the bone though because the bone heats up much quicker). My smoker didnt come with the thermometer so i ordered one on amazon. It helps a lot with understanding the cooking time, especially in a large cuts of meat. 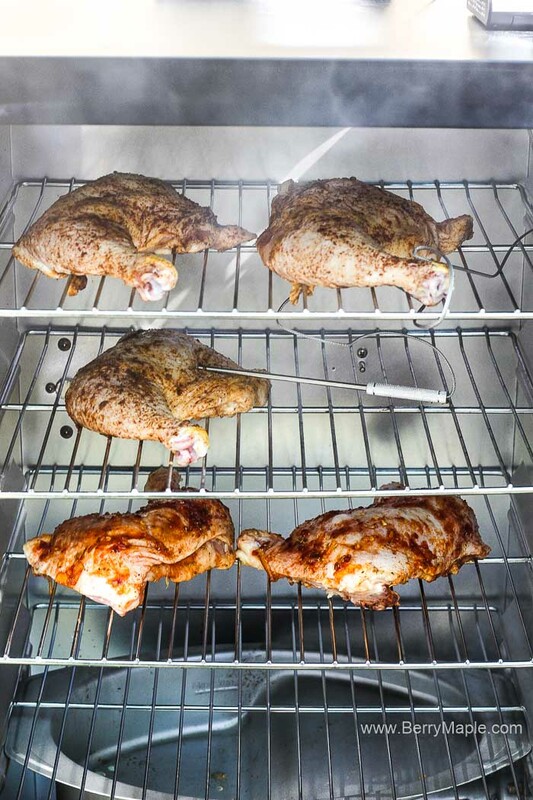 How to smoke chicken quarters in electric smoker. First you will need to use your favorite wood chips. I like Mesquite and apple wood chips , i think it pairs well with chicken. But of course you can use whatever chips you like. 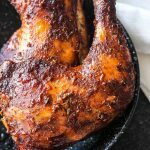 You can prepare a large batch of this rub and store until needed. Great on chicken, pork or beef! For the orange marmalade you can simply use a store bought one. Mixed with hot sauce it adds some spicy but delicate flavor to the meat. You can try to make this recipe with lemon preserves too. Let me know it the comments if you tried it! The chicken cooks at 275 degrees. When the cooking time is over, make sure to check the inner temperature, it should be 160 degrees. After you let it sit for 10 minutes (you can wrap it in foil), the temperature should rise to 165. The chicken is still coking after you take it out of the smoker. 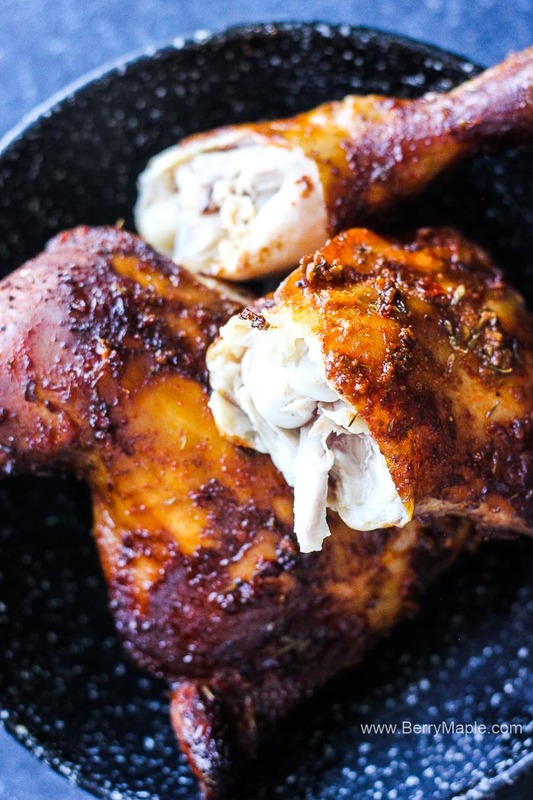 If you twist the bone, it should move easily break the chicken quarter in to two pieces. This is the best sign that the chicken is done and cooked perfectly. Well, now here is the recipe below, enjoy your cooking! Preheat your electric smoker to 275 degrees. Wash chicken and dry with paper towels. Mix all the rub ingredients. 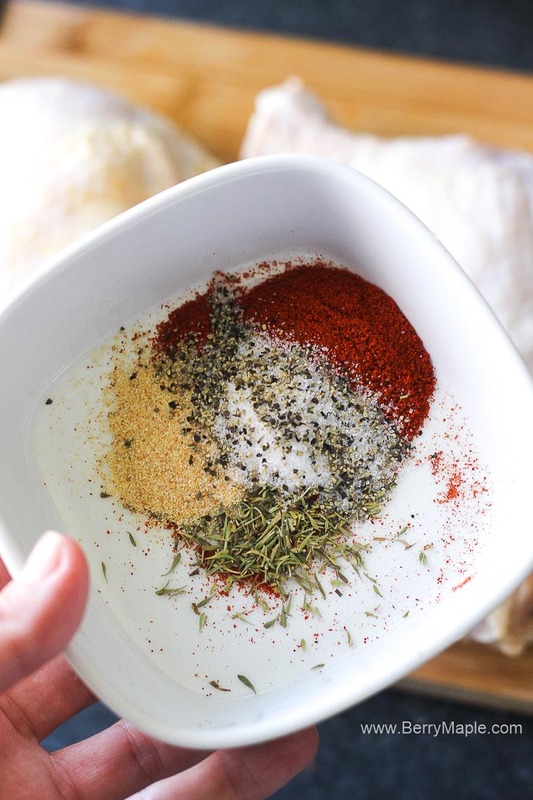 Cover chicken quarters with the rub. Brush with orange marmalade mixed with hot sauce ( under the skin too!). Place chicken in the smoker for 1 and half hours. Once cooked, take out and let rest for 10 minutes. Love the flavors! 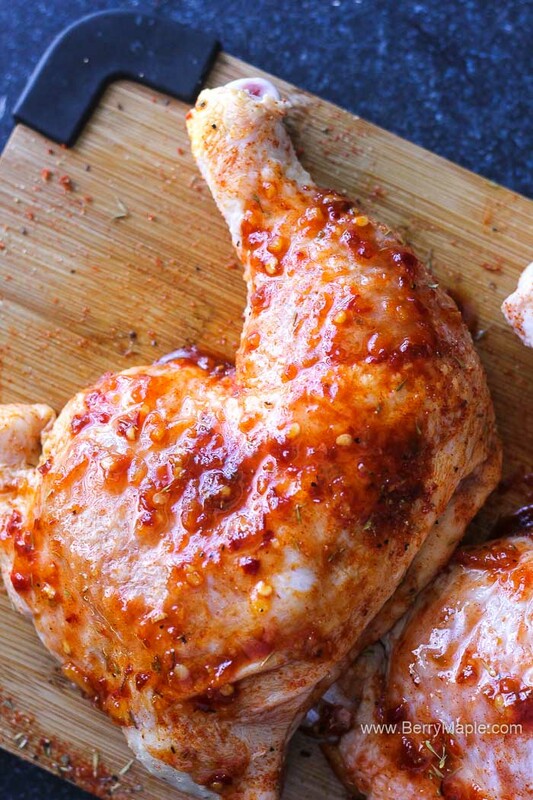 I’ve never tried orange marmalade with chicken, sounds so tasty! This really is the best. So much flavor, my family loved it,.